Garrett Helmer joins PrinterLogic as SVP of Channels to continue company’s hyper-growth through partner enablement. I love empowering the channel with truly amazing solutions to their customers’ biggest problems, so I could not be more excited about the opportunity we have here at PrinterLogic. PrinterLogic, the leading server-less Enterprise Print Management solution that enables businesses to eliminate print servers, today announced it has brought on former Cisco and Box veteran Garrett Helmer to join the company as Senior Vice President of Channels. Helmer will help PrinterLogic – which grew its customer base by 174 percent in the past year and was ranked the 107th fastest growing company in Deloitte’s 2016 Technology Fast 500 – to continue its rapid growth by expanding the company’s global channel programs. 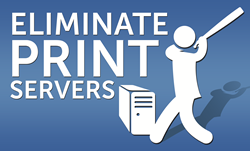 Thousands of enterprises use PrinterLogic's patent-pending printer and driver management platform to deliver Mobile, Pull and Virtual printing, while eliminating print servers and providing a self-service portal that empowers end users to install their own printers. PrinterLogic recently won the 2017 Buyers Laboratory prestigious Pick award as Outstanding Enterprise Print Environment Platform. In addition, the company has been recognized twice as one of the fastest growing companies in North America – being ranked number 141 overall (and 8th amongst software vendors) on the Inc. 5000 and number 107 on the Deloitte Fast 500. For more information, or for a free trial, please visit http://www.printerlogic.com. Questions? Watch our video or connect with us on Twitter at @PrinterLogic or follow us on Facebook, LinkedIn, YouTube, Instagram and Google+.